It doesn’t matter that summer is “officially” over. There’s still plenty of sun and beautiful weather to enjoy here on Long Beach Island. We design and build homes on Long Beach Island throughout the fall and winter so that our homeowners can enjoy the following summer. Just because you’ve packed up and left for the season doesn’t mean you shouldn’t be thinking of all the features you need to have in that new custom home you’ve been dreaming of. So, we’ve compiled a list of what’s hot for custom homes on LBI this fall. Here are our top picks for outdoor living space options. Outdoor kitchens continue to be one of the biggest outdoor trends. It can be as simple as a grill or as elaborate as a fully functional kitchen with a sink, beer station, countertops, pizza oven and refrigerator. Entertaining in your outdoor kitchen is a breeze and allows the host to engage their guests while preparing meals, drinks or snacks. 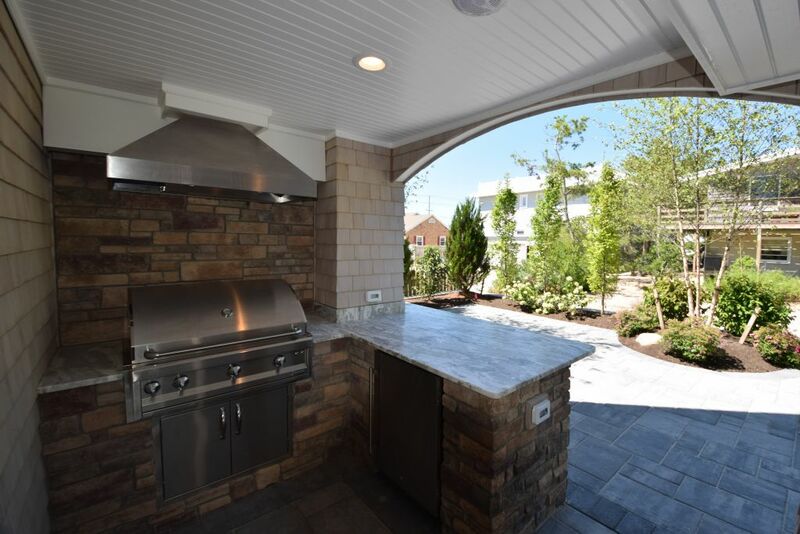 Be sure that whatever kind of outdoor kitchen you decide on you have plenty of seating away from the heat source (grill, etc.) so that guest are comfortable. Going hand in hand with the outdoor kitchen, outdoor living rooms and screened porches are popular additions to a custom home design. These extensions of your indoor space think beyond terraces and decks and offer better furnishings and can be combined with your fire pit or fireplace to create a warm, cozy relaxing oasis. Some homeowners even use curtains to define the space and include luxuries such as TV’s and outdoor entertainment centers for added luxury. Fire pits have come a long way, they aren’t just a dirt hole in the ground with some sticks and wood. Today you can find bar height gas fire pits to place your drinks on, stone and concrete fire pits built right into your patio, and coffee table fire pits with fire glass. A fire pit may be better for entertaining because more people can sit around it. A custom outdoor fireplace offers an intimate setting for just a few people. It encourages intimate conversation and a romantic ambience. On cooler summer nights and even during the fall a fireplace place or pit can be just what your new custom home needs! You’ve heard about heated flooring inside your home, but did you know heated flooring can be installed in an outside patio as well? This is another way to warm up and relax after the sun goes down and the cool ocean breezes are blowing. You can install a radiant heating system under concrete to keep your patio warm all year round. Another advantage to a heated patio is that in the winter it will melt the snow, making cleaning and maintenance much easier. 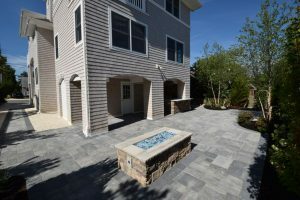 When planning your new custom home on Long Beach Island consider adding these features on the outside of your home. Your season can easily extend into the fall and even winter, which means you are sure to enjoy your home even more! Call Stonehenge Building and Development today or contact us to find out how you can incorporate what’s hot for custom homes on LBI! © 2019 Stonehenge Building & Development. All rights reserved.